Does anyone have any detailed photos of a WRNS despatch rider's hat and jacket. I have a few photos but I don't know what the jacket looked like form the back (it looks very similar to a hacking jacket), neither do I know the detail to the hat which in some photos appears to have some kind of tally on it? Also, were the bike's they rode painted khaki or in navy colours? It's hard to tell from black and white pictures. As far the photos I've seen they wear the standard ratings jacket. This 'fine weather' kit as captioned by the IWM, is a bit misleading, there's a whole mishmash of despatch clothing from the fitted navy breeches to the standard bell bottomed trousers. I've got a really good book on the WRNS and will try and remember to dig it out. Same as the bikes. Some are definitely RN painted and numbered, others are still in civilian livery. Not sure if they ever all became Navy blue or what. The detailed info is quite scarce. This is the one I have, Maureen ended up as a courier. 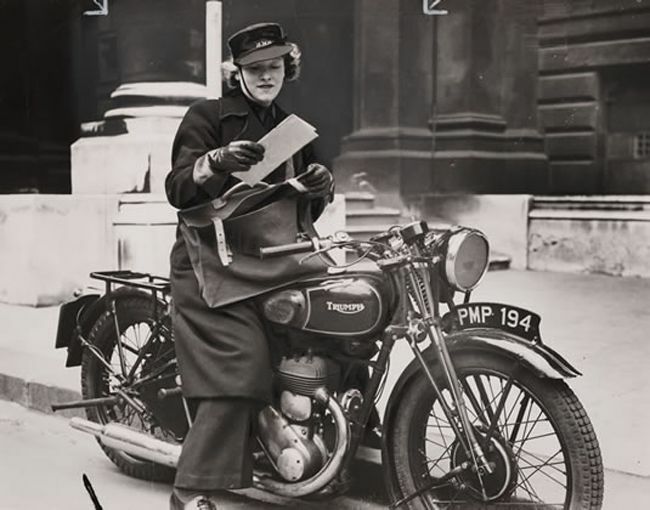 I think that extra jacket was worn as an overcoat, as you say I think extra kit was issued I've got a photo of a WRNS rider in the early pattern cap too. Just in the process of moving! The cap looks, to me, very much like the AFS women's cap and very much in the ski cap style? The bikes , as you've said, came in khaki, blue and civilian liveries! Take your pick. Here's a link to a WRNS kit list. Look for Class D ratings (DR's basically). They were issued 2 jackets. One normal WRNS and a single breasted version, both serge. The breeches were also serge!! Thanks Mike, Very helpful, especially the kit info.